Our Weight Loss Clinic is Different. Medically supervised by a Holistic, Harvard-trained cardiologist. Safe, medically designed and supervised. Detailed instructions on how to eat right during and after our program. One-on-one weight loss and nutritional coaching. Increased energy levels, concentration, better sleep, and strengthened immune system. Improved cholesterol levels, decrease blood pressure, and improved glucose numbers. Improved total well-being, vitality, and better health. Straight-on, custom weight loss consultation. A three week detox and nutrition program. The nationally recognized medically designed Ideal Protein weight loss program, which was designed over 25 years ago. 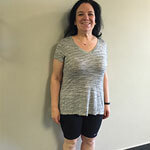 Our custom weight loss programs are especially beneficial to those with: diabetes, osteoporosis, hypertension, heart disease, obesity, poor nutrition and eating patterns, and even those with fitness goals. The proof is in the disappearing pounds, as seen in our health-changing patient testimonials below. Don’t wait to lose weight! Call 818-842-1410 today for a free initial consultation. For more life-changing weight loss stories from Dr. Thaik’s patients, see our before and after testimonials page.